10:30 AM (event will run straight through with a 30-minute intermission after group comparisons and before individual presentations/awards). Adult General Admission $40, Under Age 12 General Admission $20, Assistant (backstage access): $10. Tickets will be available for purchase online until Friday 8/9. After 8/9 they will only be available for purchase at the door the day of the contest.There will be refreshments and a professional photo booth backstage at no additional charge. If entry is received by July 21st: Entry $70. Entry fee for each additional class $60. After July 21st an additional late entry fee of $50 will apply. Monday August 5th is the last day entries will be accepted for the event. MASTERS LEGENDS OVER 50 DIVISION ELIGIBILITY: Athletes from all organizations are welcome (amateur or pro). Must be a minimum of 50-years-old the day of competition, and must have won a class at any previous contest (any organization). The top 5 in Open & Age classes will receive Viking swords, and the 1st place winners will also receive Viking trophies. 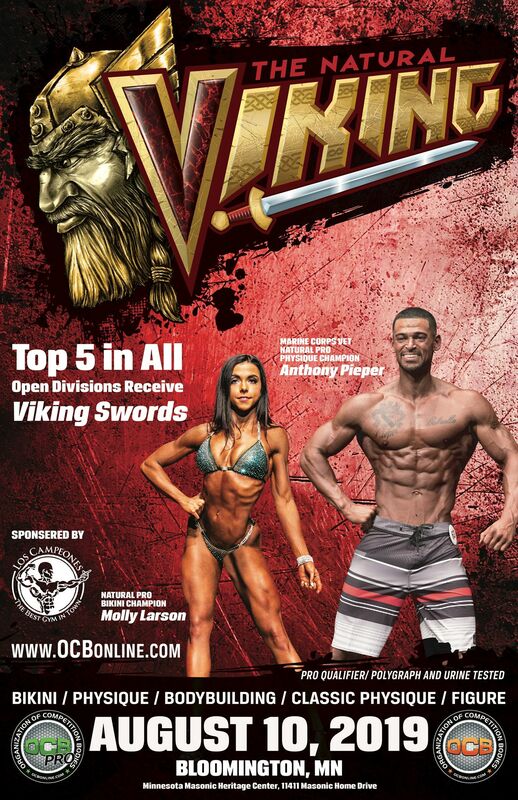 The top 5 in Debut and Novice classes will receive custom OCB medals, and the winners will receive viking trophies. Team award: A Viking battleaxe will be awarded to the team with the most number of points in the event. Best poser awards for 1 male and 1 female competitor. Top 5 in the Masters Legends Over 50 division will receive awards. 1st place will receive a Viking Battleaxe, 2nd-5th will receive Viking swords. In addition, there will be cash prizes for top 3. Competitors are required to hold current OCB memberships to participate in this event. If needing to obtain an annual OCB membership, please register by a week before the event. Memberships can be purchased on OCBonline.com. By appointment Thursday August 8th from 4:00 PM to 7:00 PM and Friday August 9th from 9:00 AM to 7:00 PM at the host hotel. Schedule an appointment. The polygraph fee is $50 and is payable at the time of scheduling an appointment. Please try to schedule your polygraph appointment so it's before your spray tanning appointment if doing both the same day. Polygraph test results are valid for other amateur OCB shows that are held within 6 weeks. View the upcoming schedule of events.